June 5th, 2005: The week started out with a couple of lovely days; then on Wednesday it started to drizzle and the next couple of days we got an inch and two thirds of rain. I think that should be just about enough rain for awhile - almost four inches since mid-May. The lake has definitely come up a few inches, which we are glad to see, but still - that’s enough! Time enough for more rain after this crop is all seeded. Away back in the early sixties, a young girl from Fishing Lake Indian Reserve came to live with us while she attended high school in Wynyard. Her name was Shirley Sunshine. Shirley stayed with us for a little over a year, but has kept in touch ever since. Shirley married a farmer from Alida, down in southeastern Saskatchewan, and settled down to raise a family. 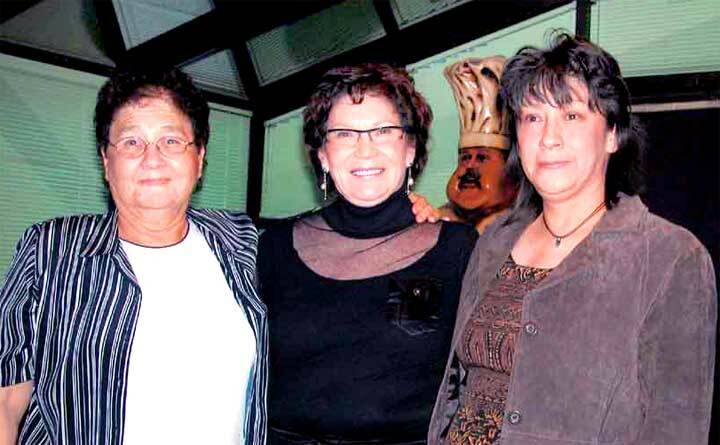 However, once the children were grown and gone, she aspired to higher education and started taking University classes, at both the First Nations University and later at the University of Regina. The culmination came last Thursday, and we went to Regina to see her receive her Bachelor of Arts degree, with a major in Saulteaux (Anichinabe) language studies. I don’t recommend University graduation ceremonies as light entertainment - you sit in a crowded auditorium for two hours watching hundreds of perfect strangers in hopes of catching a glimpse of your loved one - but I have to say it was less painful than most. The hall wasn’t hot; the sound system was excellent, and things moved along at a brisk pace. But that wasn’t the important part. That came after the ceremonies, when we got together with Shirley, her husband, Lawrence Lemieux, her children, Martin, Brent and Heather, her sisters Vera and Bernice, and her grandson, Parker, plus many friends. The Lemieux’ hosted a supper and social at Nicky’s Restaurant and we had a wonderful visit. Shirley’s parents both died many years ago, and Doreen and I were particularly thrilled when Shirley introduced us to the guests as her adopted Mom and Dad! When we sold our business a few years ago, we financed the equipment part of the deal. Unfortunately, the business failed and we are in the unhappy position of having to salvage what we can. We have spent the past three days in Tisdale scratching through the mess left in the building looking for anything that can be used or sold. Without a lot of luck, I might add - anything that had any value has disappeared; what is left is rusted, worn out, or obsolete. With the exception of the picture framing shop. That equipment looks sound, but we are too old to start another business. We will have to pull everything out and put it into storage, then try to sell it. We have reassumed ownership of all the negatives from when we started in the photography business, back in 1983. Mike returned many of them to his customers but there are still hundreds of sets left. If you had a sitting with us and would like to have the negatives, please get in touch with us quickly. We will go through them looking for any to do with our families, and when that is done we will have them destroyed. Sorry for the short report and lack of photos, but I am beat!